JioFi is a portable broadband device which allows multiple devices (smartphone, Laptops, Tablets and even Smart TVs) to access the internet at the same time. It provides Jio's high-speed 4G internet connection at low-cost data plans. You can connect up to 10 devices with JioFi at a time. As we all know, the internet speed of any network is determined by the network provider and data plan you have subscribed to. There are several other factors that can affect the internet speed of your JioFi device such as weak signals in your area, your device's configuration etc. 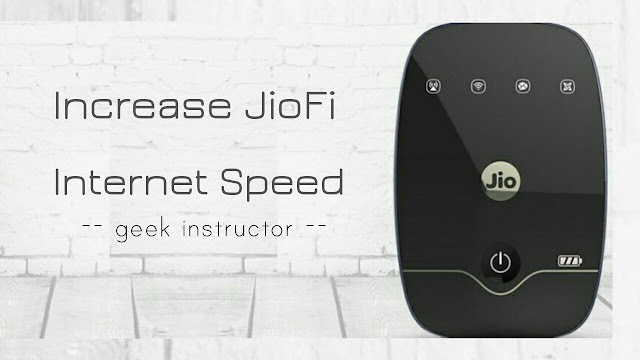 If you are also experiencing slow 4G speed on your JioFi device, this tutorial will guide you how to boost it up to fetch the maximum internet speed possible. Why your JioFi 4G speed is slow? After network signals, the second most important thing that can affect the internet speed is your device's configuration i.e. how your device is configured to connect to the internet. Daily data usage limit exhausted - If you have exhausted your daily Jio 4G data limit, your internet speed will be reduced to 128 kbps. Weak network signals - You can check the status of network indicator on your JioFi device. If it shows green color or full signals, that indicates a good network coverage. Blue or 2-4 signal bars means you are receiving average network signals. If the network indicator turns red in color or shows less than 2 signal bars, that means you are getting weak network signals. The internet speed also depends on the number of devices you have connected to JioFi. More will be the connected devices, less will be the internet speed. Similarly, it also depends on the range of JioFi signals (10-meters radius). How to increase JioFi internet speed? Keep your JioFi within a 10-meter radius of the connected device. JioFi should be placed in an open area without any obstruction coming between the JioFi and connected devices. Check the status of the network indicator on JioFi router. To get the maximum internet speed possible, make sure that the network indicator shows green color or full signal bars. Although you can connect up to 10 devices at a time, but if you want to increase the internet speed, connect only one or two device(s) at a time. As already mentioned, if you have exhausted your daily Jio 4G data usage limit, your internet speed will be reduced to 128 kbps and there is no way to increase it. You can check your Jio 4G data balance via MyJio app. If the issue is with specific app or website, try deleting the app's cached data. Make your JioFi router password protected so that no one can connect to it and use your internet data anonymously. We hope you find this guide helpful in increasing the internet speed of your JioFi device. If you want to ask something about this tutorial, please share it in the comment section.